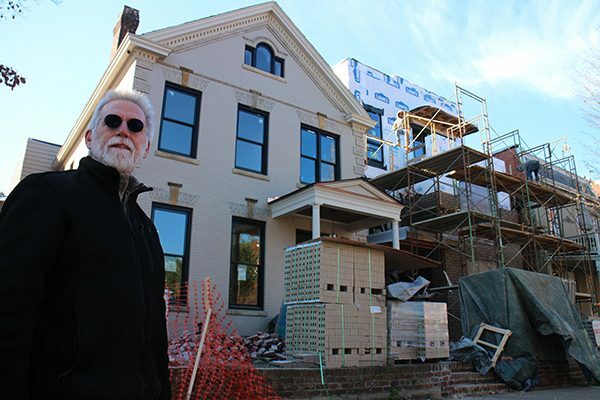 After three decades restoring dozens of century-old homes in and around the Fan, a prolific local builder is adding something new to the neighborhood with his latest project. Reid Pierce of Pierce Development is building three contemporary-style homes beside a 1920 house he’s restoring at 2409 Park Ave. The new homes – one on Park and two facing Kensington Avenue – fill what was previously one large lot for the older house, which Pierce said was the first house built in that area. 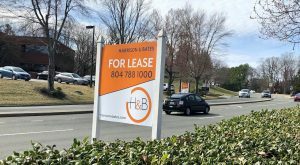 Pierce bought the house last year, when he was converting the nearby Halifax Apartments building into condos. 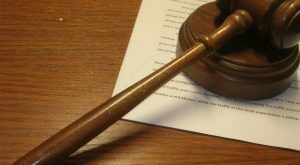 He purchased the property for $612,500 from Richard Beckstoffer, city property records show. 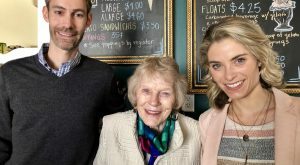 Once completed next spring, he’s planning to list all four of the homes at prices starting at $1.25 million, with the restored house likely priced higher than the others. Pierce is listing the homes, called Kensington Park, with Chris Small of Small and Associates. While he prides himself as a restorationist, Pierce said the property provided an opportunity to add something new – literally – to the neighborhood’s housing stock. The new homes facing Kensington – the first to do so on that block – replace a row of garage buildings that Pierce said were not worth saving. 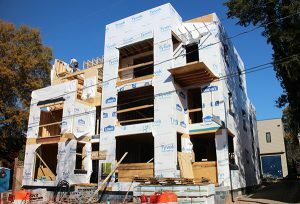 After working primarily on the older Victorian homes that fill and define the Fan, Pierce said he jumped at the opportunity to add a newer architectural style to the neighborhood. “I’ve spent the last 33 years doing nothing but historic work. I certainly could do ‘a Fan house,’ but I’m a restorationist. There’s nothing to restore on a vacant lot, so I should be able to build what the neighborhood needs,” he said. Designed by local architect Dave Johannas, the three-story homes range from 3,300 to 3,500 square feet. Each of the new homes will include a rooftop terrace with garden, an elevator, attached garage and electric car charging station. The restored house is being updated with a new, larger kitchen, and the attic has been converted to additional living space. The home’s original chestnut staircase remains, and sliding doors and other features original to the home have been restored. To access the third floor, Pierce bumped out a side wall beyond the original footprint to add a staircase above the original. 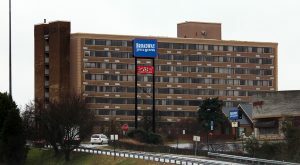 Pierce put the cost of the project overall at about $5 million. He said he funds all of his projects himself, with his volume such that he doesn’t need to involve a bank. He said he worked with First Market Bank earlier in his career. 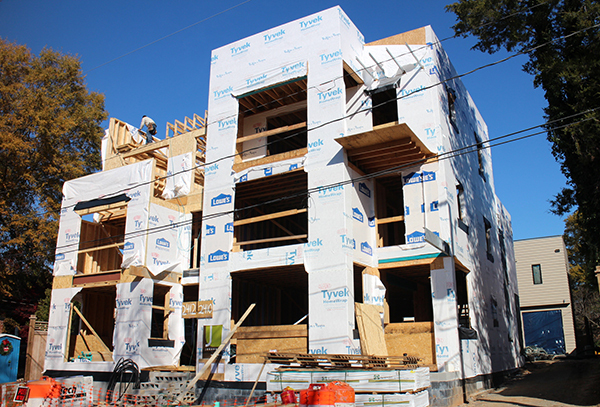 Other projects have included The Tredegar, a four-unit condo conversion on West Grace Street. The son of a real estate developer, Pierce got into the business after a stint as an actor in New York, where he built sets for productions. After 10 years with Menin Development Cos., he started Pierce Development in the early 1990s. The five-person firm is housed in the original Pleasants Hardware store building at 1607 W. Broad St.
Kensington Park joins other infill projects that are introducing new architectural styles in and around the Fan. 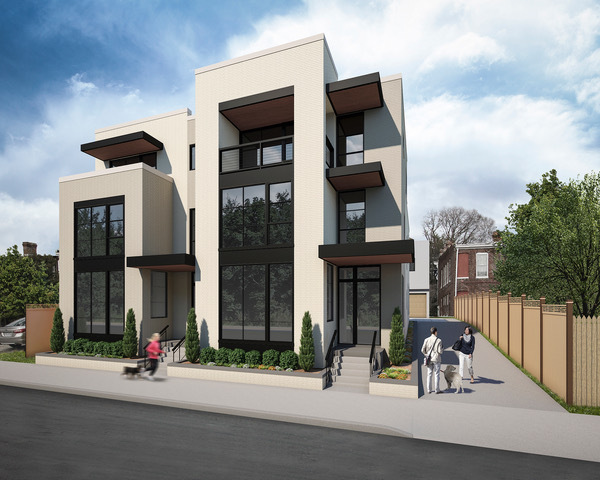 Earlier this year, Dallan Development completed its A2 project, filling land between two alleys with six modern-design townhomes. 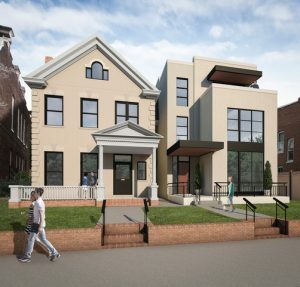 Huntt’s Row, by developer John Nolde, added eight row houses and two condos at North Robinson Street and Kensington Avenue that came online in 2016. Pierce said Kensington Park was a rare opportunity for infill in the heart of the Fan. 2 Comments on "Fan house restoration makes room for three new homes"
Very cool project! I am very interested in the history of Richmond as well as the maps. What would be considered “the Fan proper” ? Main, Cary and Grace St are not the Fan? Bill Chapman constructed a modern infill project on Floyd Ave near Robinson about 4 years ago. Is Floyd Ave not “the Fan proper” ?